This 5 reel 20 pay lines slot machine offers an array of new game features along with impressive graphics and a resounding soundtrack. Amongst its multiple attributes is the bonus round where a player has the choice of selecting the number of free spins and multiplier which is a unique characteristic. Without forgetting that the Elektra Slot game, like all Marvel themed slot machines, is linked to the Marvel Progressive Jackpot. On the Elektra slot machine, the Wild is the sultry and dangerous heroine herself and substitutes every other symbol except for the Scatter. During the free spins it expands on reels 2, 3 and 4 thus significantly increasing players odds of winning big. The free spins feature is launched when 3 Scatter symbols appear on the reels. This triggers the Weapons Bonus which is the highlight of this slot machine. At this point the casino player is requested to choose between 3 weapon symbols which will determine the particulars of free rounds. Each of the weapons carries a specific feature and it is up to the player to decide whether to opt for 10 free spins without multiplier, 14 free spins with a 2x multiplier or 7 free spins with a 4x multiplier. Once the free spins are launched, the symbol of the chosen weapon will replace those of the 2 discarded ones in order to offer more winning combinations. 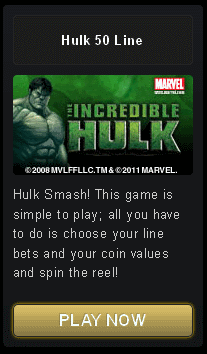 Entry to the Marvel Jackpot game can occur at any moment, through any spin whether it comes out as a winner or not and whatever the amount laid on it was. However to attain better chances of getting there quicker, it is wiser to select a maximum number of lines to bet on as well as higher stakes. Once a player reaches the Marvel Progressive Jackpot stage, he simply has to click on the boxes which make up the grid in order to uncover 3 identical symbols which will grant him one of the 4 available jackpots: Power, Extra Power, Super Power or Ultimate Power.